For the most part, the evaluation of upper gastrointestinal symptoms in diabetics should be similar to that in nondiabetics. In the assessment of GERD, however, it seems prudent to pay attention to esophageal motor function given the high prevalence of esophageal dysmotility among diabetics. 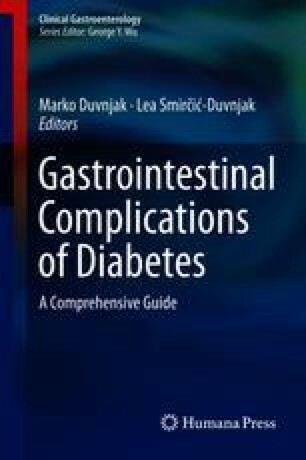 The assessment of symptoms suggestive of gastroparesis can be challenging but should, as in all instances of gastrointestinal symptomatology, begin with an evaluation of glycemic control and a search of alternative explanations for symptoms in the stomach as well as elsewhere throughout the gut. Though it correlates poorly with symptomatology, an accurate assessment of gastric emptying rate is important, if only to rule out those instances of accelerated emptying. Gyawali CP, Roman S, Bredenoord AJ, Fox M, Keller J, Pandolfino JE, et al. Classification of esophageal motor findings in gastro-esophageal reflux disease: conclusions from an international consensus group. Neurogastroenterol Motil. 2017;29. https://doi.org/10.1111/nmo.13104. [epub ahead of print].